This article was updated on 8/6/18. Residential wood framing provides structure, but drywall texture gives the wall its character. 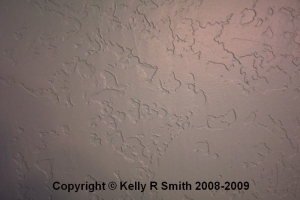 If it is time to refresh your walls you might consider an new texture There are many drywall texture techniques. 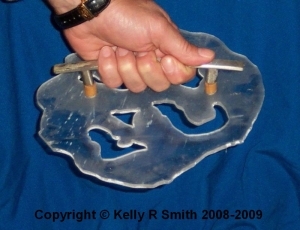 You can make a statement with this unique knockdown tool. Drywall texture patterns add character to both ceilings and walls. Additionally, they conceal a multitude of irregularities in the framing, sub-par drywall taping and floating (or drywall finishing), and patched drywall seams. There are quite a few application tools and applying a consistent pattern is an art form unto itself (Except in the case of using a drywall texture spray out of a hopper; anyone can squirt a wall). What is a Knockdown Texture? The knockdown technique got its name from the application method. The craftsman uses a patterned tool to apply the texture in the first step. When he pulls it off the sheetrock it leaves pointed peaks. In the second step a broad drywall floating knife is dragged across it to knock down the raised peaks. The tool conveys the particular pattern. The pressure applied to the knife determines the depth. Another very common technique is applied with a stomp brush or crows foot texture tool. Too involved? Its also a simple matter to apply a paint roller texture. Wide kitchen cabinet drawer handle; approximately 1 1/2 wider than your hand. A plastic drywall compound bucket is used during the application. Because the tool is going to be dipped into the bucket, the Plexiglas should be approximately round-shaped. Note: all drilling and cutting must be done very slowly and carefully to avoid cracking and splitting the Plexiglas. Use your Sharpie to sketch the basic round shape. Draw an assortment of curvy designs around the inside of the round shape (see photo). This provides a bit of an irregular outside edge. Find the center. Using that point measure out equal distances to locate where your two handle bolts will be attached. Drill out these bolt holes (the drill bit size depends on the supplied bolts). With the Sharpie, freehand random shapes on the interior of the Plexiglas to cut out. Dont put in too many or get too close to the handle holes; it will compromise the texturing tools strength. Drill pilot holes for each internal shape to insert the Dremel or Roto Zips cutting accessory bit. Carefully and slowly cut out the shapes. Cut out the outside edge. Insert the handle bolts through the holes. Measure and cut your dowel pieces to take up space difference. You want the bolt heads to flush up on the Plexiglas tool surface while allowing the handle to be approximately 1 1/2 away from the tools surface. Drill holes, just a hair larger than the bolts diameter, through the center of your dowels. A benchtop drill press is what I used to make the holes perfectly down the center. If thats not available, hold the dowel in a bench vice. Assemble the kitchen cabinet handle onto the tool. Thats about it. This tool has made me a lot of money over the years. If you would rather just hire a pro rather than try to match an existing texture, I recommend that you find local reviews on the services you need at Angies List - Where thousands of consumers share their ratings on the local contractors and service companies they hire. Learn more. . If youve got some creative drywall texturing techniques (I know youre out there), please share them with our readers in the comment section below. © 2008 KSmith Media, LLC; all rights reserved; content may not be copied, rewritten, or republished without written permission.